The Tintswalo Atlantic lodge is designed to be experienced with all of your senses. You are greeted by the sound – a quiet roar of the tide rushing in and slapping the rocky coastline. You feel the coolness of the sea mist clinging to your skin. 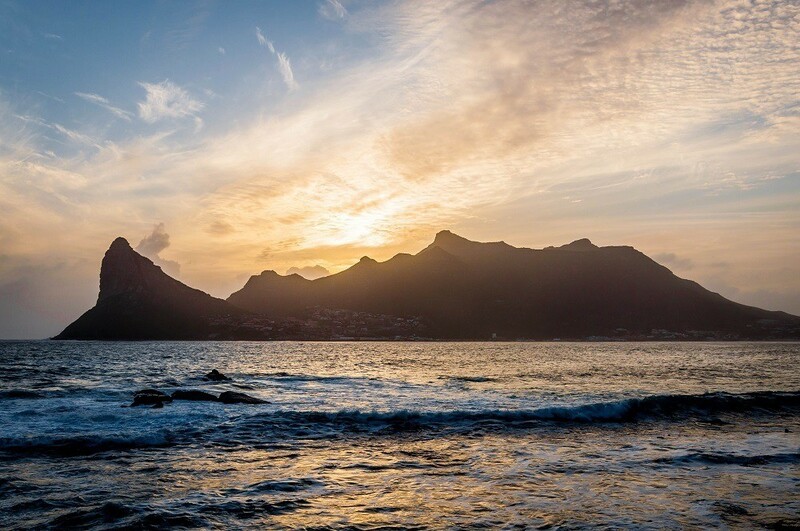 You are mesmerized by the stunning beauty of the sun setting against a backdrop of Sentinel peak and the tranquility of Hout Bay. You are assaulted by the smells coming from kitchen as you guess what magical meal you will experience that evening. And yes, you will taste perfection as amazing flavors are paraded before you night after night. Tintswalo Atlantic is just the kind of place to bring you back to your senses! 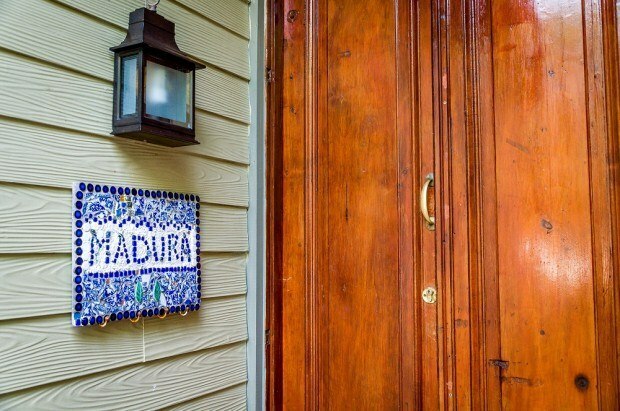 The lodge does one thing exceptionally well – blending seamlessly into the surroundings and making you forget it is there. As the only hotel within the Table Mountain National Park (part of the Cape Floral UNESCO World Heritage Site), the lodge takes great pains to integrate into the topography and conceal the structures from view. It can’t be seen from the Chapman’s Peak Drive (the start of the great Cape Point Route) several hundred feet up the mountain, so it doesn’t disturb the coastline of the bay. But the lodge surprises you in other ways. Within moments of arriving, you forget that you are staying at a hotel at all. As you sink into the over-sized chairs, you suddenly feel like you are at your best friend’s best beach house for the week. 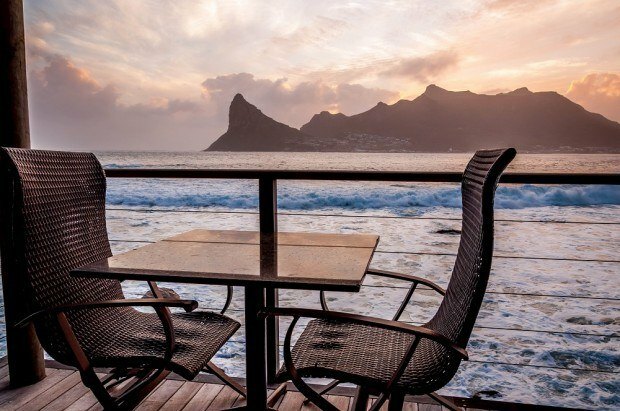 Fine dining is an integral aspect of the Tintswalo Atlantic experience. 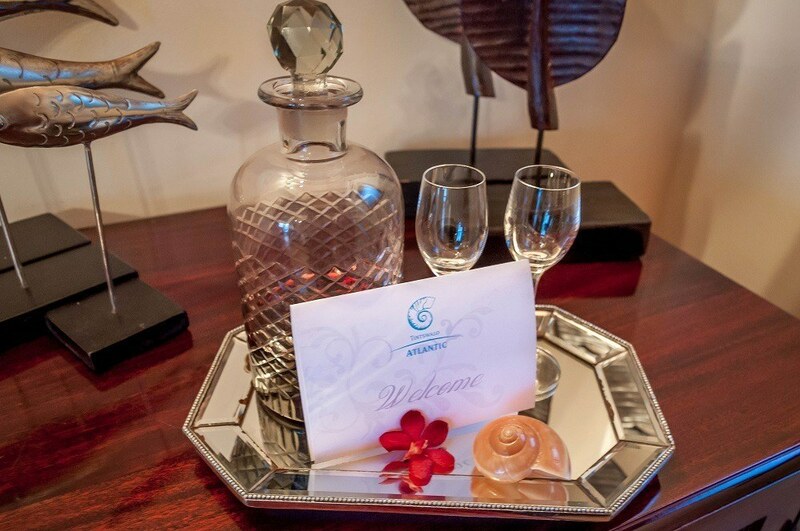 Each night, the Chef Uzane and his team dream up culinary delights that tickle the palate. The menu is customized each night based on the whims of the chef. 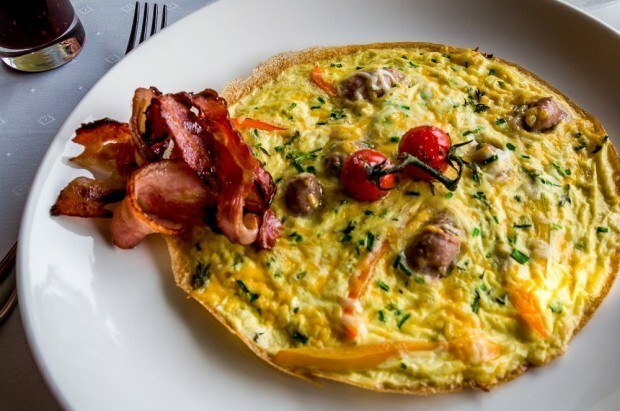 One night we had canapes of beef and vegetable spring rolls, followed by a creative mushroom and Gorgonzola tart, and concluded with a filet of beef. Another night, we had canapes of springbok and fish cake’s, followed by a zucchini and truffle soup, concluding with the locally caught fish of the day. Each course was dutifully served and explained by our personal butler Stanford. Tintswalo Atlantic is about 40 minutes from downtown Cape Town, making it close enough to access all the services and entertainment that the city has to offer, while giving you a sense of distance and space as if you were on a retreat. 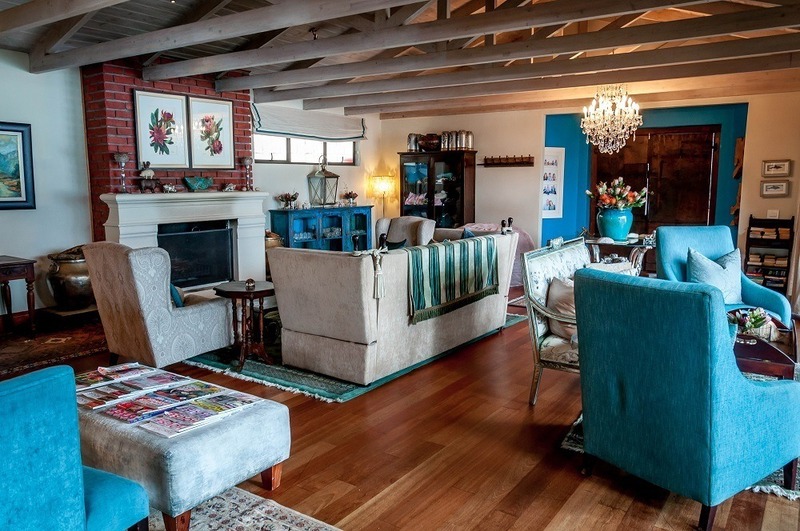 This is a perfect location to explore the region, including the Constantia wine route, Cape Point and the Cape of Good Hope, and Boulder’s Beach penguin colony. Or, you could just curl up with a good book and listen to the waves crash against the rocky coastline! 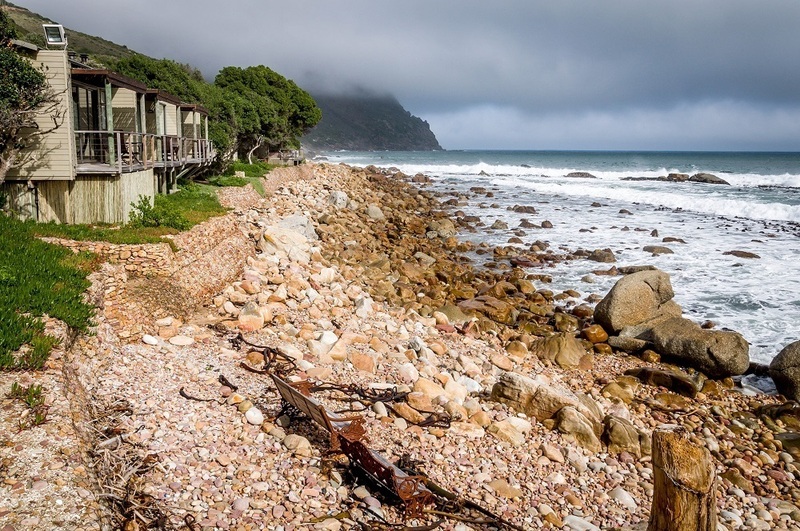 Update 2018: The Hout Bay fire of 2015 completely destroyed the Tintswalo Atlantic, however, the hotel has been rebuilt from the ground up. Check current prices for the Tintswalo Atlantic. The Tintswalo Restaurant: The dining room is located within the main part of the lodge – a long, one-story building clinging to the rocky shoreline. In good weather, the all glass front can be opened onto the sea to soak up the ambiance. The kitchen is open so guests can watch as Chef Uzane creates the evening’s specialties, or they can order off the Tintswalo Atlantic restaurant menu. Without a doubt, the food is exceptional! The Lounge: Before dinner and in the evening, we were able to enjoy a glass of South African wine or cocktail in the lodge lounge, sinking into the large chairs in front of the fireplace. The Spa and Recreational Facilities: The Tintswalo Atlantic has two heated pools. A massage therapist can be arranged. 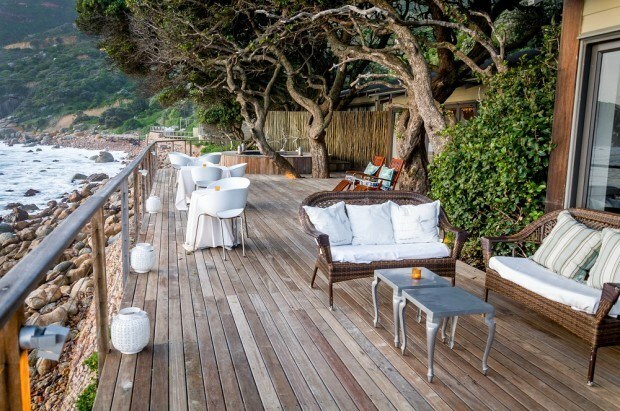 The Room: The ten chalets at Tintswalo Atlantic are named after various islands around the world. Our room, Madura, was named after the Indonesian island and featured dark woods and deep blue colors. The most prominent feature in the room is the two large sitting chairs facing the large sliding glass door and the Atlantic Ocean beyond. In one corner, there was a small fireplace, which turned into a godsend on the cool winter nights. Each room has a small balcony with outdoor chairs to have your morning coffee and enjoy the sunrise. 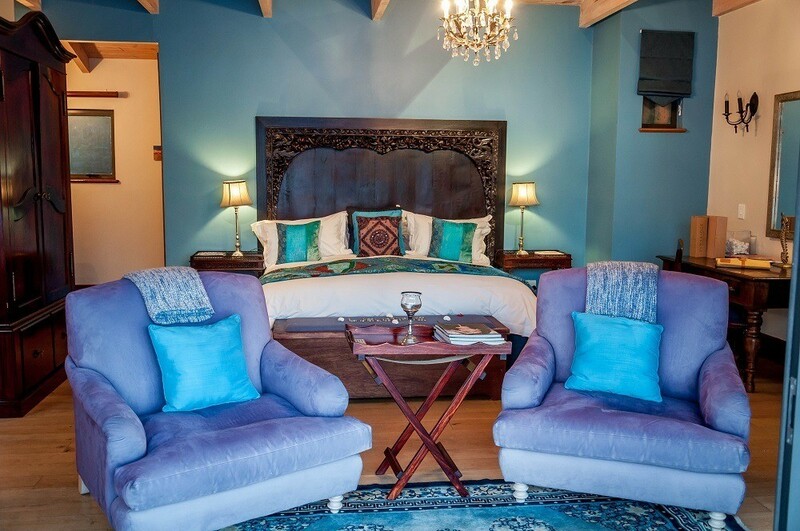 The Bed: The bed looks out directly onto Hout Bay and Sentinel Peak. There is no better way to wake up than looking out on such a majestic view! Sleeping was enhanced by a plush king-sized, American-style bed. The WiFi: The lodge had wifi in the bar/restaurant area. The Television: I honestly can’t remember if there was a TV or not. However, with a view like Sentinel peak, who needs TV? The Bathroom: The bathroom was just as splendid as the bedroom and had an open shower, dual sinks and a giant soaker tub right in the window to look out on Hout Bay. The heated floor was wonderful on the cool winter mornings! The Bathroom Amenities: The chalet had all the standard bathroom amenities (soap, shampoo, lotion, etc.). 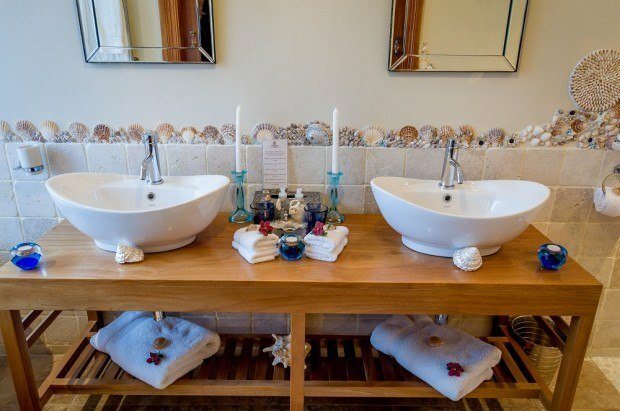 There were also many candles throughout the bathroom to set the mood for a soak in the tub. The Location: The lodge is located approximately 16 miles south of downtown Cape Town. It is about 35-40 minute drive along a very beautiful coastline. The Transportation: The lodge can arrange transportation for guests, but there really isn’t a public transportation option. The best option is to rent a car so you can explore the region. There is ample room to park your car at the gate to Tintswalo Atlantic and the staff will drive you down the steep winding road to the lodge in a hotel vehicle. The Airport Transfer: The Cape Town International Airport (CPT) is located on the flatland east of Cape Town and is 22 miles from the lodge. We allowed about 70 minutes to get to the airport from the lodge and return the rental car. 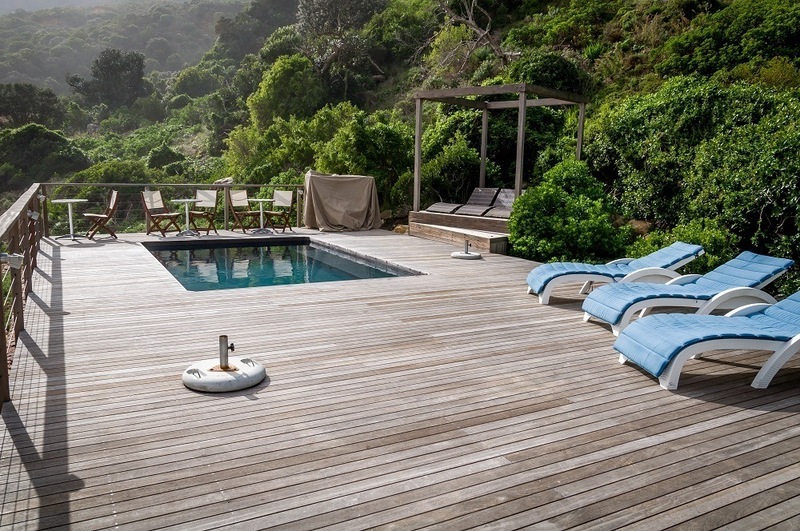 Tintswalo Atlantic is one of the most amazing properties we’ve ever experienced in the world. Words simply cannot do justice to the beauty of watching the sunset over Sentinel peak, while listening to the waves crash at your feet. Tintswalo Atlantic stimulates your senses and massages your soul! We were the guests of Tintswalo Atlantic. As always, all views are our own. Note: Some links may be affiliate links, which means Travel Addicts may earn a few pennies if you buy something – all at no additional cost to you. 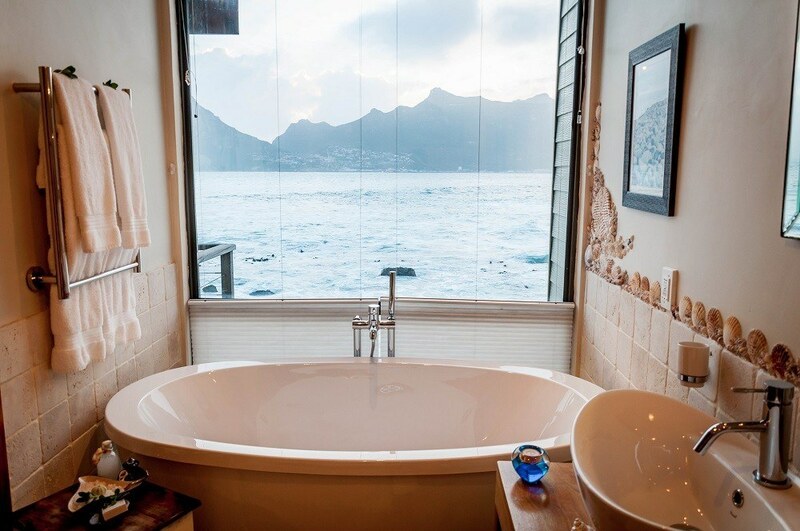 What do you think about Regain Your Senses at Tintswalo Atlantic Cape Town? Lance, we so appreciate your feedback, and are thrilled that you enjoyed your stay at the magical Tintswalo Atlantic. Your review was most gracious – thank you. Looks like a beautiful spot! We’ve got a lot of contributed posts on South Africa on our site but have yet to make it there – maybe sometime in 2015. If so we’ll keep this place in mind. It seems to be an amazing place. Love the pics. Were you happy with the wifi? It was absolutely beautiful — luxurious and relaxing while still very much feeling like you were a part of the environment. The wifi was fine — better in the main areas than in our room but decent throughout. I’ve been to South Africa twice now and would go back in a heartbeat. This place looks stellar! Looks beautiful – and just what I need right now! WOW. Beautiful. I want that view! What a lovely place, everything looks simply perfect. After reading so much about South Africa and Cape Town, I just want to go now. We absolutely fell in love with the whole country, but Cape Town has a special kind of magic about it. Couldn’t recommend it more! 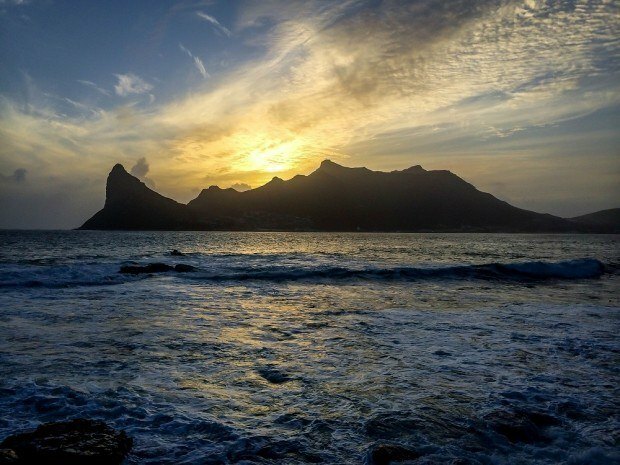 We didn’t really know what to expect from Cape Town, but we absolutely loved it too. So many things to do and see… or the option of doing nothing at all and just enjoying the ambiance. That deck! That view!! Those rooms! That food! Ahh all of it looks incredible, I would kill to spend a night here someday! Everything about the stay was perfect and gorgeous!